Work continues for the regeneration of the area of ​​Piazza Ungheria, Torvaianica – Pomezia. Arch. Benedetta Gargiulo Morelli and Arch. Simona La Cognata of NOS Design have installed a new section in the upgrading of the area, which constitutes the heart of the community of Torvaianica. 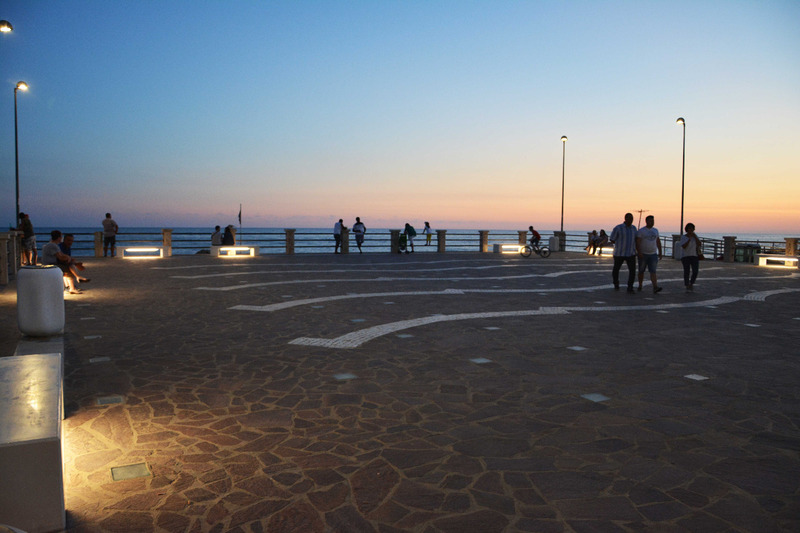 At sunset, Piazza del Belvedere will be illuminated, thanks to the new benches installed along its edges. Because of these, the central space of the piazza has been released from the old furnishings and totally revived. 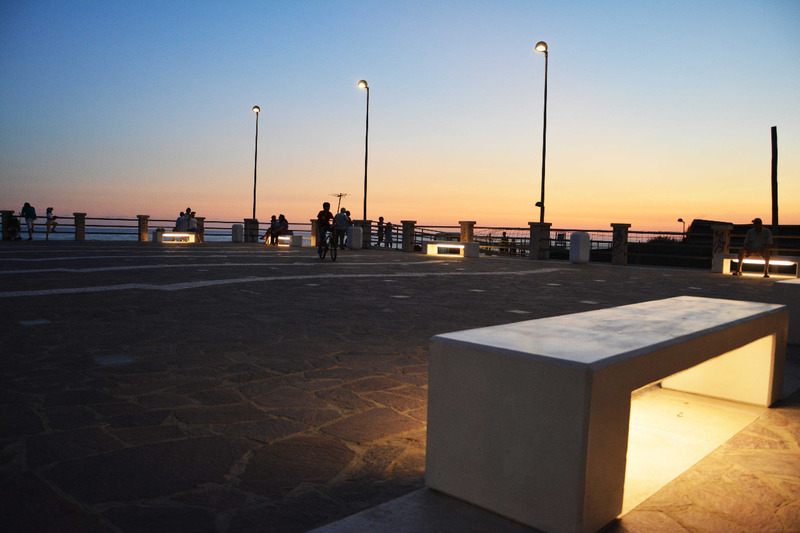 These benches were installed in continuation with the ones placed on the adjacent Piazza Ungheria – together they create a consistent line of lights tracing the horizon and overlooking the sea. Along with these were inserted new prismatic-ovoid baskets, which contrast the linear benches. The baskets were deliberately positioned only along the edge of the seafront border in order to free the view towards the beach. Present on the margins is a planned operation that would not only make the central space more enjoyable, working with the frequent events organized by the municipal administration, but which would also give it more value: the new furnishings would fit perfectly into the piazza, blending seamlessly almost as if they had been there forever. The intervention is a continuation of the works begun last summer in the area of ​​Piazza Ungheria. It also foresees the replacement of the existing balustrade along the Belvedere itself. The project aims at bringing community and a sense of belonging back to a place which has unjustly lost its dignity over time. Both the benches and the chosen baskets are of the same type and manufacturing company as those installed in the previous year’s operation: Calzolari for the benches, Metalco for the baskets.